It's hard to find diverse genre fiction, as many of you know, so when I find a new author who writes fantasy or science fiction or mystery, I get very excited. That's how I felt when some of my digging led to Mardi Oakley Medawar. Medawar is a Cherokee author who writes mysteries set in the American west in the years following the Civil War. One of her series centers on a healer, Tay-Bodal, in the Kiowa tribe. The series gets rave reviews, so I was pretty pumped to get the first book from the library recently. 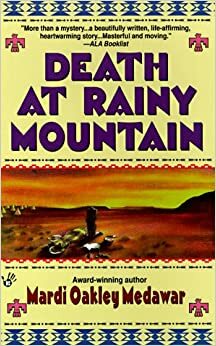 Death at Rainy Mountain is set in 1866. While at a gathering to vote for a new chief, a tribal leader has been murdered, and a brilliant young warrior, The Cheyenne Robber, is accused of killing him. Families accuse other families, and Tay-Bodal is pulled into the drama. If he can't clear The Cheyenne Robber's name within 5 days, then the warrior will be banished and never heard from again. There are a lot of great things about this book. First and foremost, Medawar offers a ton of information about life in the Kiowa nation around the mid-19th century. This was amazing because it's hard to find books that show the daily life and culture of various tribes. I especially liked learning about how egalitarian Kiowa culture was; women's votes were required for many important measures. I also liked seeing some key historical characters, like Satanta (White Bear), in their element. So many big personalities, booming laughter, and fantastic detail was present here. You can see that Medawar really wanted to bring to life history from the Kiowa side, filled with details and personalities and motivations that are often ignored in the way we learn American history today. Unlike many mystery series I read, this one is much more light-hearted and fun. It reminded me of Lindsey Davis' Marcus Didius Falco series. Much as I love Malla Nunn's Detective Cooper's mysteries, they are pretty heavy. It's nice to see a historical mystery series that shows us the lighter side of life. I really liked the aspects of the story I mentioned above. But there were several other things about this novel that bothered me. For example, the women are all pretty ridiculous. They either shriek and nag at everyone or they just suffer silently through what life has given them. It just feels very dated in the way women are presented (at least, I hope it's dated), and I was disappointed that a woman author would focus so much on giving us so many great men but so few women. There was literally a scene in which women had a catfight about who was the most deserving of a sought-after man. Ugh. And another in which Tay-Bodal wanted to show his woman that he was boss and so said and did some ridiculous things (though she is ridiculous, too, so I suppose they deserve each other). Another thing that bothered me was the way at least two couples fell in love with each other at first sight. I don't like this sort of plot unless it's in a fairy tale, and it just felt lazy. Towards the end of the book, especially, I was just over the ridiculous portrayal of women and the bizarre and unnecessary complications of the romantic plots. I didn't give this book a very high rating because of those issues. That said, I will probably read at least the next book in this series. I really did enjoy the way Medawar brought the Kiowa community to life, and I would love to learn more about it. Hopefully, the issues I encountered in this book were due to it being her first novel and they won't be as prevalent in the next book. :( I was just started to get really interested in this book until you mentioned the badly drawn women.Still, I'll add to the TBR list because it does sound interesting. I feel the same way as Fence. :-( I may give this series a try though. I'll be waiting to hear what you think of the 2nd one before I dive into these. The good parts sound great, but I would be really put off by the things you mention. Keep me posted on how the later books in the series go. If things get better with the lady stuff, I'll probably try some of these. Oh man! You had me all hooked there until you got to the naggy lady parts. I'd love to learn more about Native American heritage, especially since I have some Cherokee blood but am not in contact with that part of my family. Plus instalove? Ugh! Like everyone else, I'll be watching to see how the series progresses.